CUPERTINO, California—October 28, 2013—Apple® today announced financial results for its fiscal 2013 fourth quarter ended September 28, 2013. The Company posted quarterly revenue of $37.5 billion and quarterly net profit of $7.5 billion, or $8.26 per diluted share. These results compare to revenue of $36 billion and net profit of $8.2 billion, or $8.67 per diluted share, in the year-ago quarter. Gross margin was 37 percent compared to 40 percent in the year-ago quarter. International sales accounted for 60 percent of the quarter’s revenue. The Company sold 33.8 million iPhones, a record for the September quarter, compared to 26.9 million in the year-ago quarter. 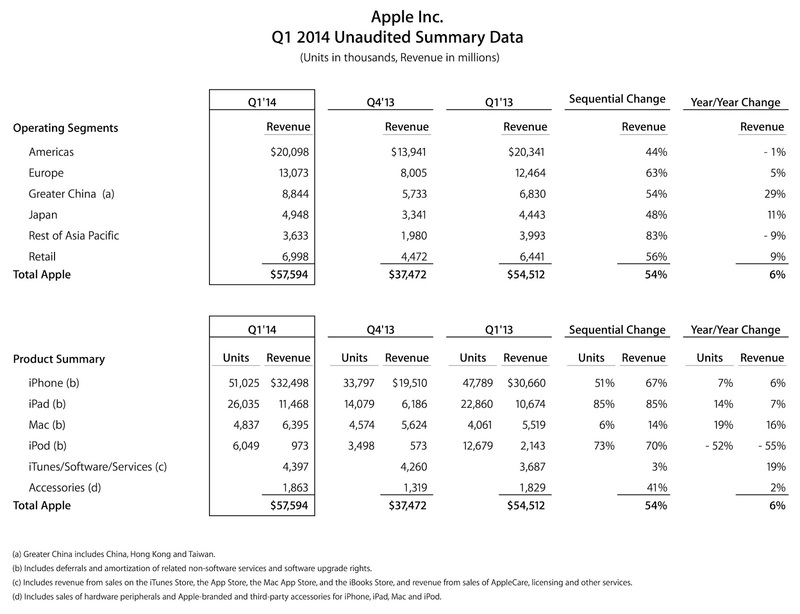 Apple also sold 14.1 million iPads during the quarter, compared to 14 million in the year-ago quarter. The Company sold 4.6 million Macs, compared to 4.9 million in the year-ago quarter. Apple’s Board of Directors has declared a cash dividend of $3.05 per share of the Company’s common stock. The dividend is payable on November 14, 2013, to shareholders of record as of the close of business on November 11, 2013. “We generated $9.9 billion in cash flow from operations and returned an additional $7.8 billion in cash to shareholders through dividends and share repurchases during the September quarter, bringing cumulative payments under our capital return program to $36 billion,” said Peter Oppenheimer, Apple’s CFO. Apple will provide live streaming of its Q4 2013 financial results conference call beginning at 2:00 p.m. PDT on October 28, 2013 at www.apple.com/quicktime/qtv/earningsq413. This webcast will also be available for replay for approximately two weeks thereafter. This press release contains forward-looking statements including without limitation those about the Company’s estimated revenue, gross margin, operating expenses, other income/(expense), and tax rate. These statements involve risks and uncertainties, and actual results may differ. Risks and uncertainties include without limitation the effect of competitive and economic factors, and the Company’s reaction to those factors, on consumer and business buying decisions with respect to the Company’s products; continued competitive pressures in the marketplace; the ability of the Company to deliver to the marketplace and stimulate customer demand for new programs, products, and technological innovations on a timely basis; the effect that product introductions and transitions, changes in product pricing or mix, and/or increases in component costs could have on the Company’s gross margin; the inventory risk associated with the Company’s need to order or commit to order product components in advance of customer orders; the continued availability on acceptable terms, or at all, of certain components and services essential to the Company’s business currently obtained by the Company from sole or limited sources; the effect that the Company’s dependency on manufacturing and logistics services provided by third parties may have on the quality, quantity or cost of products manufactured or services rendered; risks associated with the Company’s international operations; the Company’s reliance on third-party intellectual property and digital content; the potential impact of a finding that the Company has infringed on the intellectual property rights of others; the Company’s dependency on the performance of distributors, carriers and other resellers of the Company’s products; the effect that product and service quality problems could have on the Company’s sales and operating profits; the continued service and availability of key executives and employees; war, terrorism, public health issues, natural disasters, and other circumstances that could disrupt supply, delivery, or demand of products; and unfavorable results of other legal proceedings. More information on potential factors that could affect the Company’s financial results is included from time to time in the “Risk Factors” and “Management’s Discussion and Analysis of Financial Condition and Results of Operations” sections of the Company’s public reports filed with the SEC, including the Company’s Form 10-K for the fiscal year ended September 29, 2012, its Form 10-Q for the quarter ended December 29, 2012, its Form 10-Q for the quarter ended March 30, 2013, its Form 10-Q for the quarter ended June 29, 2013, and its Form 10-K for the year ended September 28, 2013 to be filed with the SEC. The Company assumes no obligation to update any forward-looking statements or information, which speak as of their respective dates. Apple, the Apple logo, Mac, Mac OS and Macintosh are trademarks of Apple. Other company and product names may be trademarks of their respective owners.